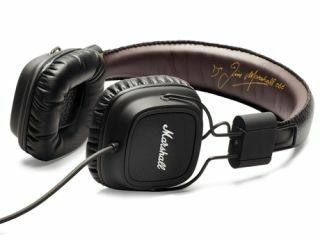 As announced last month, Marshall Amps' sideline into the headphone market has indeed come to fruition today. The Major model pictured above costs €99 and features a luxurious headband that "bears the original Marshall texture" because it's "made out of the same vinyl used in Marshall amplifiers." The Minor in-ear model costs €59 and includes an EarClick patent that "ingeniously secures the earphone into position in your ear." It also comes equipped with a microphone and remote for use with your mobile phone. While we're sure Marshall has overseen the design and build process with an Iron Fist, manufacturing duties were passed on to a company called Zound Industries who make headphones for a bunch of 'global brands'. Still, it looks like the sleek design is enough for most because the Minors have already sold out.